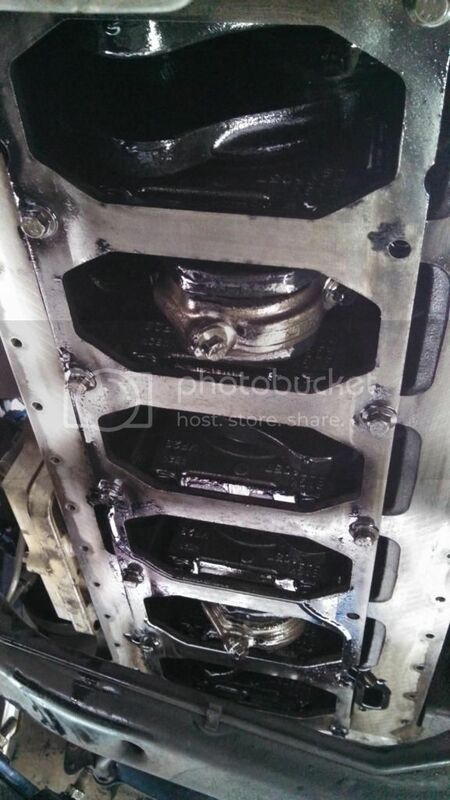 Dodge Cummins Diesel Forum > Technical Articles - Writeups - Guides Section > 3rd Gen Tech Articles > 3rd Gen Oil pan Removal...with pics! 3rd Gen Oil pan Removal...with pics! Well as the title states I wanted to do a quick write up on this so hopefully someone in the future can make use of the info and not be scared to go at it! I have to give a big thanks to both my buddies Andrew and Andrew for the help, place to wrench, and tools! 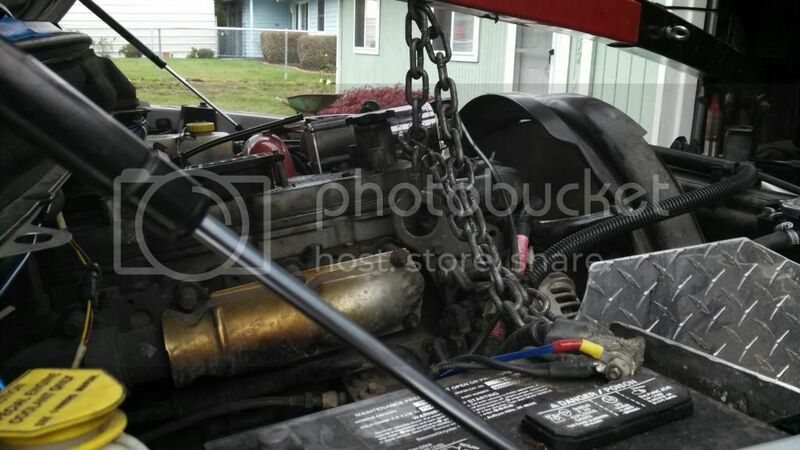 Both are very knowledgeable diesel mechanics which certainly didn't hurt to have around. I brought a case of beer as I knew with that around they would stay close! This was my first time ever having to do this. I was nervous about it but they calmed my nerves. I started a thread a while ago about thinking I had a rear main leak, but from the awkward place it was coming from we decided to give the oil pan a shot first, as it looked like more of the culprit. There are tons of writeups on this subject, and a few different ways to go about it. I have a 04.5 6sp, and this way worked perfect and should work for any 3rd gen.
Make sure you have the Cummins pan gasket and a couple of pickup tube gaskets, just in case you damage one. I have a 5" downpipe, which is pretty close to the fire wall, so that needed to be disconnected. Then we took out the intake tube (un plugged MAF) and filter all the way down at the turbo, just to have room. I also had a broken V-band clamp as well on the outlet, so that eased with getting to that, but really didn't pertain to the oil pan. 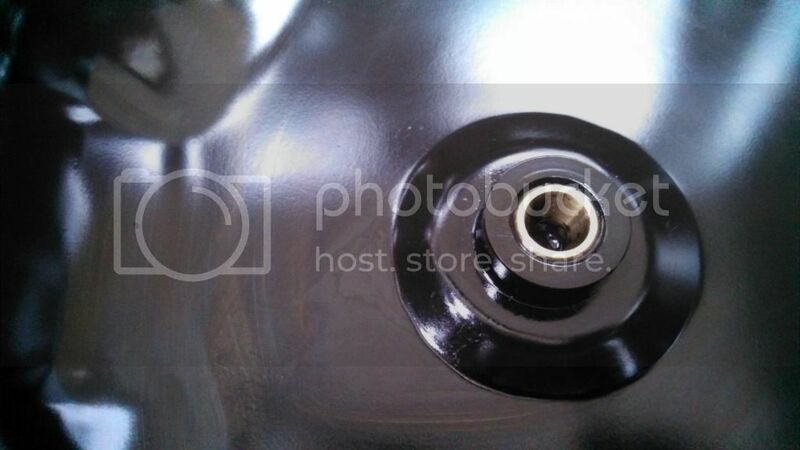 Next was the black Cummins plastic vanity cover over the actual valve cover. These things were all we needed to remove/ take out in order to gain clearance. Next was loosen only the passenger side motor mount. We opted to use the "rotate" (motor will rotate about the driver side motor mount) technique that we had found a thread on CF. This bolt does not need to come all the way out...in fact, it should not come out all the way, as it acts as a guide when the motor is lowered back into the mount. The key was having a cherry picker. You want to connect it to only the front lift eye on the motor. Check out the photos below for positioning of the hoist: Note that at this point the motor was lifted all it needed to be to gain access. The fan shroud did not cause any issues leaving it in place. 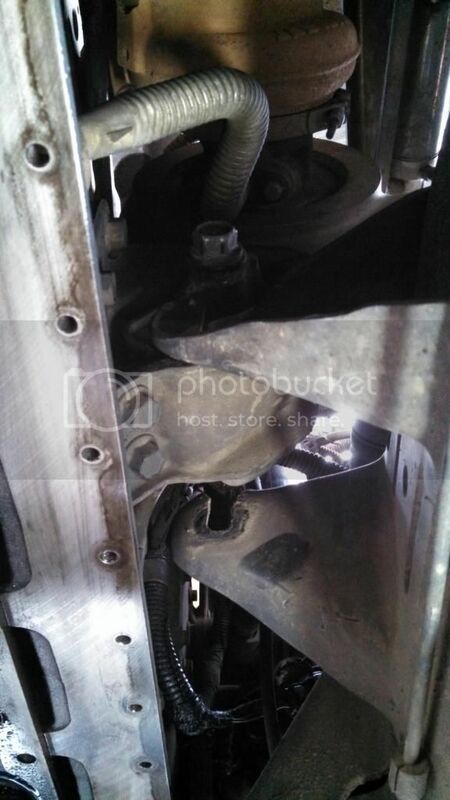 Once you are in place, loosen and remove all but two of the oil pan bolts. They can be opposing in the corners. The next steps it's very helpful to have a second set of hands. Remove those final two oil pan bolts while one person holds the pan in place. Let it drop down. One person should be by the nose of the pan and one should be at the rear of the pan towards the bell housing. The pan can now drop down. You will need to get in and un bolt the pickup tube. 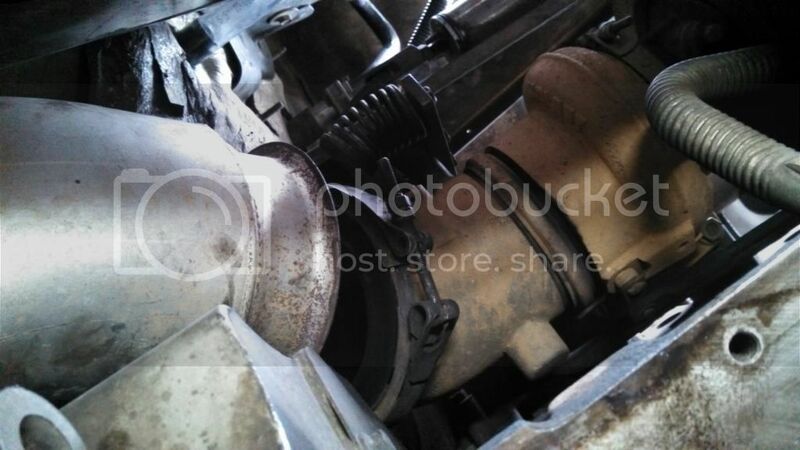 I believe the actual inlet has two 10mm bolts and the support bolts are 13 mm. Whoever is in front can get the two 10mm and the single 13mm from the front. Pass the 13mm back to your buddy and he can get the 2nd support bolt. Let 'er drop in the pan. We tried just sliding it out at this point and we needed another half inch of clearance...but the axle was causing us to not get the rotation we needed. So jack up the passenger side frame rail behind the tire. When you pull the pan out, pull it out and an angle as if you're pulling the back side (towards the bell housing) down and towards the passenger rear wheel. She will slide out. 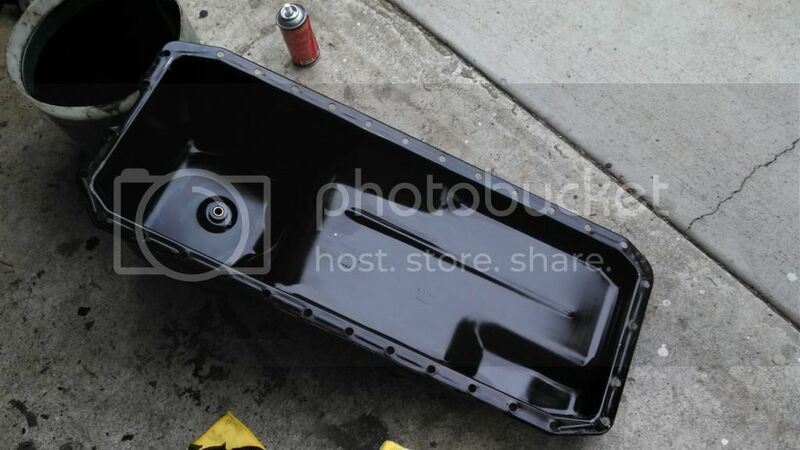 And then clean out the oil pan and scrape and buff the sealing area if necessary. I was lucky (kind of) and my mess of gasket mainly was stuck to the block. I cleaned out the oil pan as well. I was happy to see that there was no debris of any kind in my oil pan. Once the pan is all cleaned up, we did a light coating of the Ford Motorcraft super gasket maker (it's grey) on the sealing portion of the pan. This stuff is awesome. It seals really well and it acted as a bond too so the oil pan gasket would stay in place while we wiggled the pan back in. 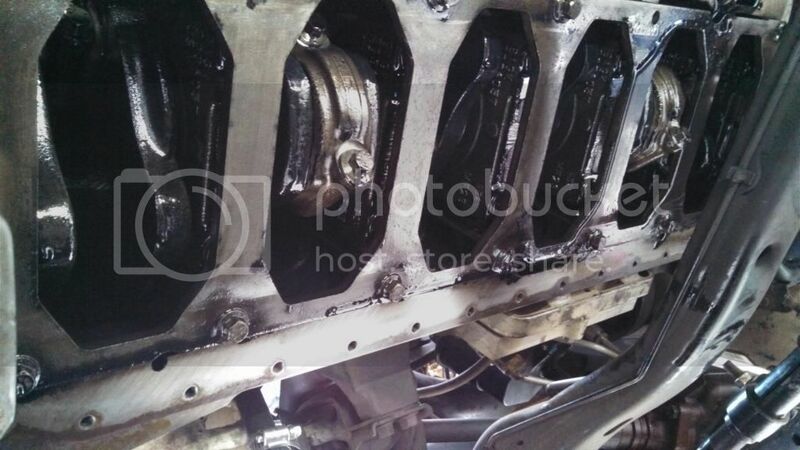 We did not coat the block though; just the gasket to the block for sealing. With the pan in place, the pickup tube needs to be bolted back in, this is a bit tricky, so use that second set of hands. 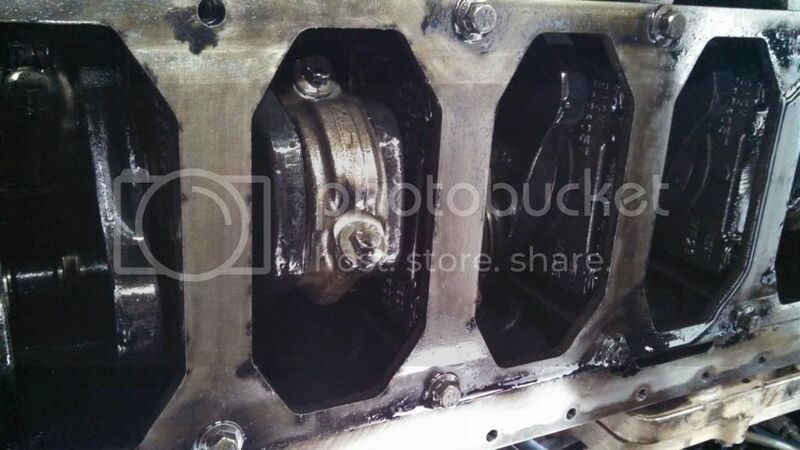 Before the pan gets put back into place, put 4 dabs (one in each corner) of your gasket maker where the bellhousing meets the block, as well as where the timing cover meets the block. This is where leaking can occur. I ran a bead along the entire length in the 4 areas where they meet up. Tighten all the bolts up just snug. We let the pan sit for about and hour like that to let the gasket maker have a chance to set up. Once that was done, torque all the bolts to the recommended spec. It's not much so don't go reefing on the bolts. They can snap. 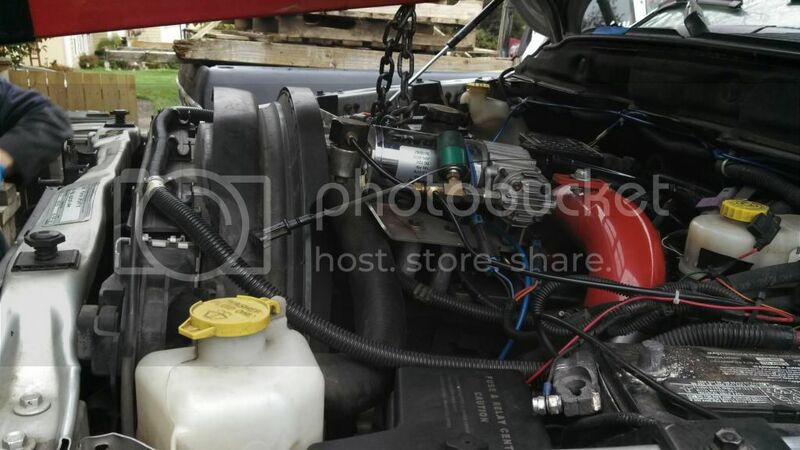 At this point you should be able to lower the engine back in it's mount, and since you are only rotating on the driver side, it should self guide. Have someone underneath just to make sure. Tighten that up, and anything you removed earlier make sure to put back on the truck! I will continue to check the pan for the next week or so, and I will probably re torque the pan after my road trip this coming up weekend. It may or may not need it. 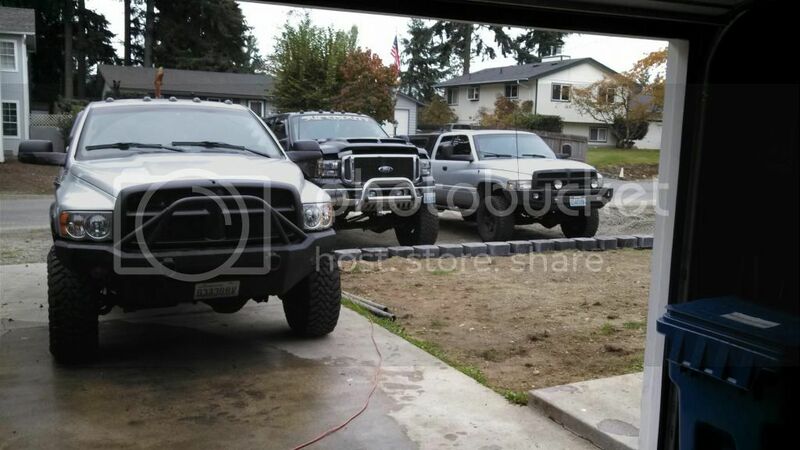 And just for fun, a photo of the trucks (mine's on the left) hanging out after the work. The Ford got some new injectors yesterday as well. It was a busy day! Good luck guys! It wasn't a terrible job at all... I actually had fun!! I want to update this thread because it was brought to my attention that I forgot to mention something that may be of use. When removing/installing the pan, look up at the crank and connecting rods' lower bearing cap. if one is lower than the rest, the oil pan will snag on it and make it more difficult to remove or put back in. Bump the starter until they are in a position that won't catch on the pan.